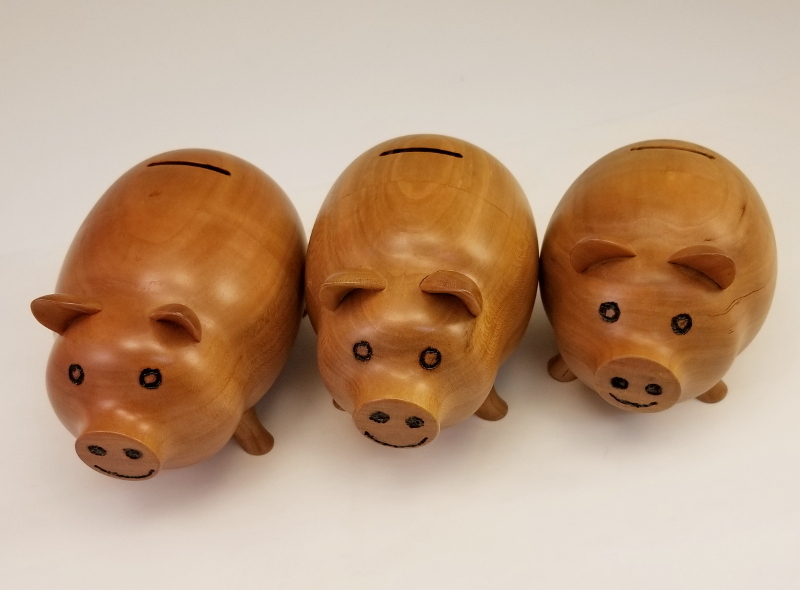 I made piggy banks for my grand sons and my newest great nephew. Made a snug wedge fit for the two half's so they can be opened, Started with a 4" block ended up about 3-3/4 round and from 4-1/2" to 5-1/2 " long each one 1/2" longer, Made of cherry with oil polly finish. takes a bit of time. Probably will give them out at Christmas. Life is what you make of it, change your thinking, change your life! (06-16-2018, 11:01 AM)Phil Thien Wrote: Alright, those are spectacular. That is Cute and nicely done to Don. How did you do the tails and ears? (06-16-2018, 12:38 PM)Arlin Eastman Wrote: That is Cute and nicely done to Don. How did you do the tails and ears? For the tail I turned a 3/4 to 5/8 " dowel, round off the end/ sand corners off and cut off about 3/16 thick . took a scrap piece of 1/4" ply and sticky taped the disk flat side down on it. draw the curly on it and cut out the inside curve on bandsaw. clean up with dremel. Those are great; really cute. You know I keep forgetting how much can be done off of the lathe also. I guess I keep thinking one dimensional. Very nice,you are going to have some very happy kiddies. 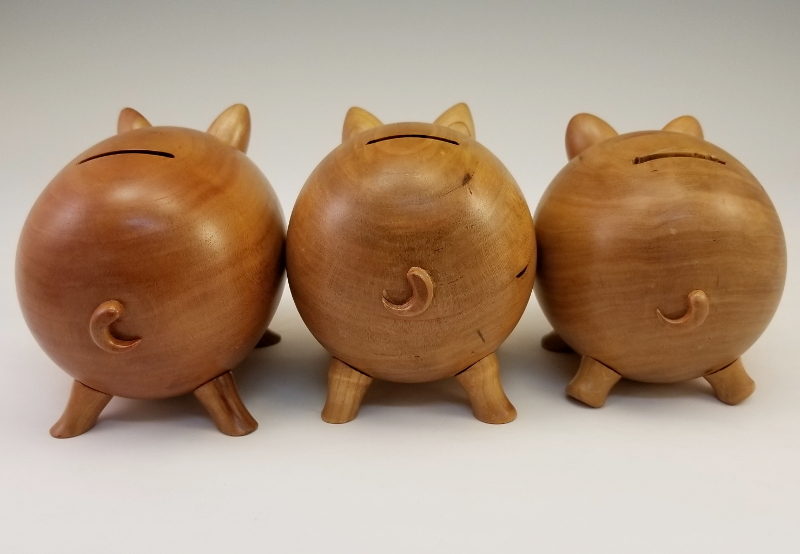 (06-16-2018, 10:42 AM)Woodshop Wrote: I made piggy banks for my grand sons and my newest great nephew. Made a snug wedge fit for the two half's so they can be opened, Started with a 4" block ended up about 3-3/4 round and from 4-1/2" to 5-1/2 " long each one 1/2" longer, Made of cherry with oil polly finish. takes a bit of time. Probably will give them out at Christmas. I like how you think. Nice work! 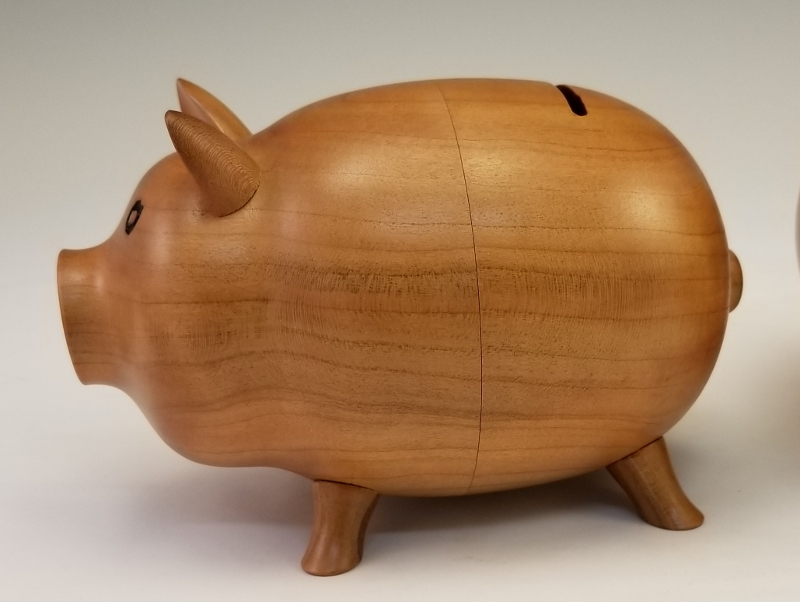 I like how you oriented the grain so it gives the piggies balance. How did you do the lips, mouth and eyes?